What Is The Most Popular Carat Size And Cut For Engagement Rings? Although this site focuses primarily on the world of diamond substitutes, if it has sparkle and can be worn on the finger, I have a hard time boycotting the topic. Because Cubic Zirconia and diamonds alike are worn as bridal rings, there are always interesting jewelry questions that pop up. Diamonds are simply more expensive than substitutes. You can be on a budget and still afford a 5 carat Cubic Zirconia design. Choose a real diamond of the same size and it may cost half of your yearly salary. If you could visit 1000 jewelry stores and ask them what carat weight and stone cut they sell the most of, what would it be? Diamonds have been synonymous with engagement rings since they first became popular in the 1930s. This stone is said to represent eternal love, strength and perpetual affection. 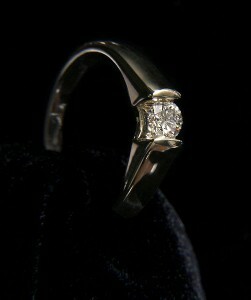 With their popularity, endless options have become available allowing for a truly customized engagement ring. However, the most popular carat weight and cut for diamond engagement rings are testament to their timelessness and beauty. While many people believe that a carat is equal to the size of a diamond, a carat is actually the internationally-used weight unit used to measure diamonds. The carat weight of a diamond is equal to a weight measuring 0.2 grams. Rough diamonds, a diamond which has not yet been cut, come in a variety of sizes, shapes, colors, and purities. Today, the most popular carat size for engagement rings is 0.37. This 0.31 carat diamond engagement ring is almost as large as the average 0.37 carat size. This gives you a better idea of the actual size as it relates to a setting. The cut of a diamond is especially important when choosing an engagement ring. The cut is a diamond’s most important feature and will have the greatest overall impact on a diamond’s beauty. While the cut of a diamond does not refer to the shape of the stone, it does refer to the polish, proportioning, and symmetry. Currently, the round brilliant cut is the most popular cut given to engagement ring diamonds. This cut, first developed around the 1900s, tends to showcase a diamond’s beauty and shows off the sparkle and shine associated with the stone. Whichever carat weight and cut is chosen for an engagement ring, it is import to work with a reputable jeweler. With poor workmanship, even the most beautiful diamond can appear to be lifeless and dull. Also highly recommended; purchasing diamonds that have been graded and certified which will allow the purchaser to be assured they are getting what they have paid for. Choosing the carat weight and cut for the perfect engagement ring can be a fun and rewarding experience as part of the process of popping the question.